Truro City are being forced by the Football Association to upgrade their Treyew Road ground despite moving stadium at the end of the season. The National League South club will spend about £50,000 to ensure it meets league standards by the end of March. They will play just three home games there after the deadline before leaving to share Torquay's stadium, and will then move to their new Silver Bow site. "It's an absolute waste of money," said Truro chairman Peter Masters. "You would've thought that common sense would prevail but the trouble is if they (the FA) set a precedent with Truro they've got to agree with other clubs as well." Under FA rules, all clubs in the sixth tier of English football must have a ground at 'Grade B' standard, or face being kicked out of the league. Truro gained promotion last season and will have to make further improvements to their 4,000-capacity ground if they make the National League South play-offs. "Truro City FC, like all member clubs, are aware of their requirement to fully meet their obligations to grading and there is no leeway whatsoever in this," said a spokesman from the National League. "Truro City FC are fully aware of this." 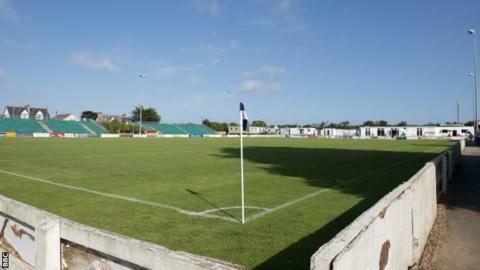 Truro have sold their ground to developers, who plan to build a retail park on the site. "The money will equate to nearly a season's matchday takings," Masters added to BBC Sport. "If we didn't have to pay it out the home fans could've come in for nothing for the whole of the season. "It's a substantial amount of our turnover." Whitehawk, Maidstone United and Wealdstone are the teams who will visit Treyew Road after the deadline set by the FA. The £50,000 is being funded by Truro's shareholders, which includes Masters, and he is resigned to the bill. "I don't want to complain too much as we signed up to the league," he said. "It's a big hit but there's very little else I can do. "Being based in Cornwall we pay extra for transport and players as it is, so it's all against us. It's unfortunate but that's the situation."